CRAIG LEWIS looks ahead to the final three matches in round 13, including the highly-anticipated South African derby between the Bulls and Sharks. In the context of the uninspiring Australian conference, this is a crucial contest – particularly for the Rebels, who have now lost four games in a row after such a promising start to the competition. It means that the Rebels are now four log points behind the conference-leading Waratahs despite having played an extra game, and this Saturday’s Australian derby must now be seen as a must-win match. A real concern for the Rebels will be the fact that they have missed the most tackles (26) and conceded the most penalties and free kicks (13) per game of any team this campaign. South African coach Dave Wessels will know that his side needs to clean up their act this Saturday, but he should also see a clear-cut opportunity for the Rebels to return to winning ways against a struggling Brumbies team. The Rebels have won three of the last five meetings between these sides, more than they’d managed in their previous nine (won two, lost seven). The Brumbies have won five of their six home games against the Melbourne-based side (lost one) – those five wins coming by an average margin of 25 points. The Rebels’ last six Australian derbies have all been won by the home side (Rebels won two, lost four). The Rebels have missed the most tackles (26) and conceded the most penalties and free kicks (13) per game of any team this campaign. Henry Speight has scored four tries in his last four games against the Rebels, gaining in excess of 100m in a game twice in that time. Brumbies – 15 Tom Banks, 14 Henry Speight, 13 Tevita Kuridrani, 12 Christian Lealiifano (cc), 11 Andrew Muirhead, 10 Wharenui Hawera, 9 Joe Powell, 8 Rob Valentini, 7 Tom Cusack, 6 Lachlan McCaffrey, 5 Sam Carter (cc), 4 Rory Arnold, 3 Allan Alaalatoa, 2 Folau Fainga’a, 1 Scott Sio. Over the past two seasons, there have been three fascinating battles between these two teams at Newlands. The Chiefs will reflect fondly on back-to-back playoff victories – most especially a 60-21 thrashing in 2016 – but the Stormers won’t have quickly forgotten their thrilling 34-26 regular-season victory last year. Once again, viewers should expect the unexpected on Saturday. The Chiefs are ranked first in terms of per-game averages for metres made (510.9), clean breaks (15.8) and scrum success (94%), and should provide the Stormers with one of their most challenging defensive tests of the season. In this regard, the Stormers will be pleased with the significant improvement they displayed on defence against the Bulls last weekend, which was a hallmark of a 29-17 victory that has resurrected their campaign in many respects. The South African conference battle has descended into a real scrap, with just four log points separating the sides from two to five, while the Lions’ once imperious lead has been cut back to eight. With this in mind, all the teams in the SA group will be keeping a close eye on the battle between the Lions and Highlanders on Saturday morning, before looking to take full advantage should the Johannesburg-based side suffer a defeat in Dunedin. In recent weeks, the Stormers do appear to have established a better balance to their all-round game, and they will be determined to carry that momentum into this crucial clash against the ever-dangerous Chiefs. Of real benefit to the Stormers is the fact that Damian Willemse has been granted the opportunity to remain on Super Rugby duty for one more week before he joins up with the Junior Boks. His role will be of importance in terms of game management against a side that is lethal from broken play, while he must do his part to keep elusive opposite number Damian McKenzie in check. The Stormers remain unbeaten at home this season, but a battle against a top New Zealand side is sure to provide far greater insight into the real playoff credentials of the Cape-based outfit. The Chiefs have won five of the last seven games between these sides (lost two), twice overturning a half-time deficit in that run. The Chiefs have lost just four of their last 27 games against South African opposition (won 21, drawn two). The Stormers were responsible for two of those defeats. The Stormers have won nine of their last 11 regular-season games when hosting New Zealand opposition, although those nine wins have come by an average margin of just eight points. The Stormers have booted 18 penalty goals this season, the equal most of any team in the competition. Damian McKenzie has made 15 break passes this season, more than any other player in the competition. The Sharks should head into this clash feeling that they are due a victory over the Bulls. History shows that the Pretoria-based side has gone unbeaten in its last six games against its coastal foes, while the Sharks have not managed a win on their last five visits to Loftus. It’s the sort of record that will irk the Sharks, while the word from Durban this week suggests that they will be out for some revenge after suffering an embarrassing 40-10 loss to the Bulls at Kings Park earlier this season. Although that result might be in the back of their minds, the Sharks will be riding a renewed wave of confidence after producing the performance of their season in a 38-12 thrashing of the Highlanders last weekend. By contrast, the Bulls have hit a stumbling block in recent weeks following back-to-back losses against the Highlanders and Stormers, which has seen them slip to the bottom of the South African conference. It all makes for what should be an enthralling contest in Pretoria, where there is no clear-cut favourite. The Sharks have been the epitome of inconsistency this season (four losses, one draw, five wins), and the big question is whether they can back up last weekend’s effort with another irrepressible performance. 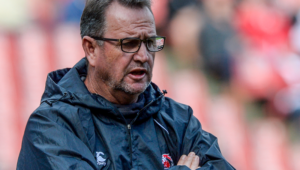 The Bulls should be aware of what’s coming, and will look to enforce a blueprint of establishing ascendancy at the set pieces, while nullifying the influence of influential ball-players such as Jean-Luc du Preez, Andre Esterhuizen and Rob du Preez. Understandably, the Sharks have made just one enforced change to their starting lineup as Jacques Vermeulen replaces the injured Philip van der Walt, while the Bulls’ run-on XV has been boosted by the return of Trevor Nyakane and Travis Ismaiel. The Sharks will also need to be wary of the Bulls’ twin poaching threat posed by Marco van Staden and Roelof Smit, which contrasts the physicality of the Durban-based side’s big back row. If last Saturday’s enthralling derby between the Stormers and Bulls is anything to go by, this contest in Pretoria should also be right up there as one of the games of the weekend. The Bulls have finished six of their last eight games with a 100% goal-kicking accuracy, missing just three of 29 attempts at posts in that time. The Bulls (164) have scored more first-half points this season than any other team in the competition. Rob du Preez has made eight try assists this campaign, the equal most of any player in the competition. The Sharks flyhalf also leads the competition in total points scored (132).